Few philosophers have as wide of an impact on the general public as ethicist Peter Singer, this week's guest on the Rationally Speaking podcast. Singer's utilitarian arguments about how we should treat animals, why we have a moral obligation to give to charity, whether infants should count as "people," and more have won him widespread fame - and notoriety - over the last few decades, and have contributed to the launch of multiple movements. Tune in to hear his discussion with Massimo and Julia about why he's a utilitarian, and how his views of utilitarianism have recently changed (and find out how he influenced Massimo's life, years ago). Peter's pick: "The Better Angels of Our Nature: Why Violence Has Declined"
Link: "The why and how of effective altruism"
Very enjoyable podcast as always. Kind of wished that you would have raised your criticisms of utilitarianism with Singer a little bit more, as it would be interesting to me to hear the two of you thrashing out the arguments in favour of utilitarianism versus virtue ethics (I lean towards utilitarianism myself). I think I would disagree with Singer on a few points. I think that mathematical truths are essentially truths by definition, which he dismissed out of hand. Mathematics can be characterised as the study of the implications of formal definitions, so there need be no appeal to any other category of truth than that. So, I think that his defense of moral realism on the grounds that it may be sort of like mathematical truth doesn't really work. A friend once pointed out to me that it was curious that I very firmly believe in the existence of mathematical objects, while very firmly deny that moral truth exists. I agreed at the time, but now I think I see how the two views are actually very compatible. In mathematical Platonism, there is no One True Math. All mathematical systems, however defined, are game for study. There is no One True Geometry, there's Euclidean Geometry and Hyperbolic Geometry and others. However, if you're a moral realist, there is One True Morality. Either virtue ethics is correct or utilitarianism is correct - usually not both (unless you have some way of unifying them). Moral anti-realism is often described as the rejection of absolute moral truths, but it could be just as well characterised as the acknowledgement of the existence of an infinite multitude of possible moral systems. I'm also interested but not particularly swayed by the analogy to the drowning child. In the drowning child analogy, there is precisely one person in the world in the position to help the child, so the responsibility is on your shoulders alone, meaning you feel a greater share of the responsibility. It's also a very rare occurrence. Your life as a whole is rather unaffected by this one intervention, but if we are persuaded that we should help one starving child in a distant land the same argument could be used ad infinitum for the millions of other starving children and our lives would be impossible. Helping the drowning child also has a comparatively certain outcome. The child will survive, thrive, and become a productive member of society. Giving aid to charity is much more dodgy. You don't know the money is going to get to where it needs to go, and you don't know if it's really going to make a lasting difference or if it's just going to perpetuate a cycle of dependency. As a heuristic it makes very good sense for people to care about those they personally come across. Regarded as a distributed moral algorithm, this is a much more effective way of getting aid to where it needs to go than if everybody is equally concerned with the well-being of everybody else. Such a world would be entirely unworkable. Caring about your neighbours means that generally speaking every person has access to aid and support, without getting swamped by all the pain and suffering in the world at large. That's not to say that we don't have a moral responsibility to those strangers who don't have the support they need. I do actually believe that our moral responsibility is in principle pretty similar no matter how far removed we are, and ideally we would spend money so that it would give the most effective net benefit to the world. But even though I agree with Singer in an ideal world, the intuitions we feel in the drowning child parable are entirely rational and in truth the world could be no other way. The reason it feels wrong not to save the drowning child is not that the child is nearby, but that you're the ONLY ONE who can save the child. If there were lots of people in and around the pond, you'd feel much less obligated to save the child. That's the bystander effect. But if you do save the child, you'll be a local hero. Here's another thought experiment. Suppose we discover that some sea creatures such as starfish constantly experience severe pain that can only be alleviated with huge doses of morphine. Are we obligated to spend lots of money to alleviate their pain, with nothing to show for it? Because it sure feels like flushing money down the drain. Massimo has strongly criticized Sam Harris for saying that science can come to objective moral truths based on utilitarianism, but went easy on Peter Singer when he said something similar. Massimo previously challenged consequentialists by posing the moral dilemma where your mother or child is trapped in a burning building with an important person like the President. Which of the two are you more morally obligated to rescue? 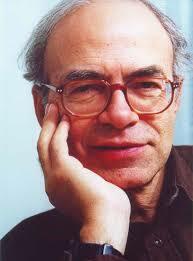 Peter Singer talks about children dying of malaria, but suppose it turns out that mosquitoes feel pain. Would it be wrong to eradicate them? If all species are equal, would he advocate eradicating humans to save mosquitoes? He opposes experimenting on animals, because we wouldn't perform such experiments on humans, but I'd be curious how he responds to the organ transplant dilemma, where one person is killed to save five. Maybe he wouldn't be so opposed to experimenting on humans either. I hope these are strawmen, but you never know with fundamentalist consequentialists. Oh, and if you don't experiment on animals, then you are in effect experimenting on humans. I agree with your about view about formal mathematical truths being true by definition, though I think it is more precise to say that they are true in virtue of following logically from formal mathematical definitions, and axioms, etc. The situation is a bit different with mathematic statements of ordinary language, I think, however. These are semantic truths - statements true in virtue of the meanings of relevant words. To take a contrary view, i.e. to think the statement 'Two plus two equals four' is true in virtue of an extra-linguistic fact that two things joined with two things yields four things, is to be, as Wittgenstein put it, bewitched by language. The observation that two things joined with two things yields four things is not an independent vindication of the statement 'Two plus two equals four' but simply an exercise in pondering the statement's meaning. It's the language that is prior to the "observation" rather than the reverse. Prof. Singer said nothing in line with Harris that I heard. In answering Julia's question about the is/ought division, he said the division is intractable but that that is okay because ethical claims have a ground of truth other than the empirical. They are truths of reason. I agree with this, but I disagree with Prof. Singer that these truths are akin to mathematical truths. One way or another, mathematical truths are truths of linguistic meanings. Ethical truths, on the other hand, do not rest on semantics. My view is that they rest on rationality applied to ethical contexts. As an illustration, why do we take it as true that other things being equal two people who put the same amount of money into something should get equal benefit from it? My answer is that it because contraries of this statement have no rational justification. How could one justify getting more benefit than the other from something when both put the same amount in, other things being equal? I suspect that this is how ethical truth in general works. Ethics concerns the resolution of opposed interests; ethical and unethical actions concern the rational justifiability of such resolutions. A problem with "utilitarianism" is that it is not "pure" consequentialism. The basic difference between several types of consequentialism, is the answer to the question: consequences to whom? This question can't be answered with an appeal to consequences. For an egoist only consequences which affects him are relevant, while the altruist would point to the consequences for others. But it's unclear which of these answers is the (most) correct one. Any choice between either of these positions, is fundamentally a deontological one. Utilitarians believe that we have a duty to take the interests of others into account.